“Another three points down the drain,” was how Ballyclare Comrades manager Eddie Hill summed up Saturday’s 2-1 defeat to unfancied Loughgall at Dixon Park. 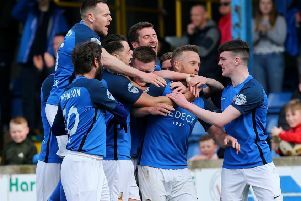 “Once again we took the lead and despite having the major share of possession, we were unable to see out the game, so Loughgall walked off with the points and left us with nothing to show for our efforts,” he fumed. Hill faced several selection problems with Andrew Doyle and Chris Getty injured and Simon McGowan unavailable. Top strikers Chris Trussell and Randal Reid had to be content with a place on the bench, having missed training sessions. Reflecting on this, Hill added: “That left us without a recognised striker but Andrew Simpson, who is an attacking midfielder, operated up front and was the only one who ever looked like being able to get an equaliser in the second half. “The boys have been putting in plenty of effort in the training sessions to improve their skills, but in recent weeks they have not been able to put away chances. “On the other hand, Loughgall created three scoring chances and took two of them, and that won them the points. “We did everything right until the final third of the pitch when either the decisive final pass or poor finishing let us down. It’s becoming embarrassing to repeat this week after week, but it’s a fact,” he emphasised. “We needed three points to lift us well clear of the relegation zone, but now we find ourselves drawn into a dogfight to stay above Loughgall, PSNI and Dundela in the run-in. “We are off to Armagh this weekend and this will be no easy one against a team that lost out to league leaders Bangor on Saturday in the quarter-final of the Intermediate Cup.